FILE - Israelis hold American and Israeli flags with the new U.S. Embassy in the background in Jerusalem, May 14, 2018. Seventy years after Israel's founding, images of victory and violence showcased the contradictions that bedevil the Jewish state. Seventy years since the day of Israel's founding, wildly contrasting images of victory and violence showcased the contradictions that bedevil the Jewish state. Deadly protests flared along the Gaza border, where troops killed dozens of Palestinians, while politicians feted the new U.S. Embassy in Jerusalem as a symbol of ironclad alliance with Washington. And with improbably odd timing, seemingly oblivious to both, crowds gathered in liberal Tel Aviv to exult over the winner of a campy European pop contest. Nahum Barnea, Israel's leading columnist, said the events highlighted the country's fragmented nature and how even after seven decades it still cannot escape its conflict with the Arabs or its unquenchable thirst for recognition. "This is a small country that typically lives only one story, usually either that of readiness for battle or bereavement," he said. "This was really an unusual example of the mythological national campfire coming apart." Barnea said the Arab threat, or even the perceived threat, has existed since Israel's 1948 founding. And as long as that's the case, he added, there will always be an element of national cohesion. FILE- Palestinian protesters chant slogans as they burn tires during a protest on the Gaza Strip's border with Israel, May 14, 2018. Monday's violence was limited to the Gaza border area, unlike the full-scale wars of recent years in which missiles rained on Jerusalem and Tel Aviv, and that enabled much of Israel to direct its attention elsewhere, Barnea said. But in Israel, it is difficult to escape the effects of the 50-year occupation of Palestinian territories captured in 1967. Israel's continued control over millions of stateless Palestinians, and years of failed attempts to resolve the conflict, drive political discourse, fuel societal divisions and draw near-daily criticism from friends and foes alike around the world. Indeed, Israel's two largest cities, which symbolize its two opposing political camps, seemed to be doing their best to ignore the violence and seemingly intractable conflict with the Palestinians. FILE - Ultra-Orthodox Jewish men wave signs, some protesting the draft, and chant outside the new U.S. Embassy in Jerusalem, May 14, 2018. The heavy Palestinian death toll, along with hundreds of wounded, made Monday by far the bloodiest day of cross-border violence since a devastating 2014 war between Israel and Hamas. It further dimmed already bleak prospects for President Donald Trump's peace plan. 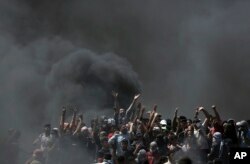 The Gaza protesters set tires ablaze, sending up thick plumes of black smoke, and hurled firebombs and stones toward Israeli troops across the border. The Israeli military, which has come under international criticism for firing on unarmed protesters, said Hamas militants tried to carry out bombing and shooting attacks under the cover of the protests and released video of protesters ripping away parts of the barbed-wire border fence. It was the culmination of more than a month of weekly demonstrations aimed at breaking a crippling Israeli-Egyptian border blockade. But the U.S. Embassy move, bitterly opposed by the Palestinians, added further fuel. In Jerusalem, the Israeli government celebrated the ancient city's Jewish history, Israel's control over it, the president who finally moved the U.S. Embassy there, and the ever-closer ties between the two countries. There was no direct mention of Gaza. 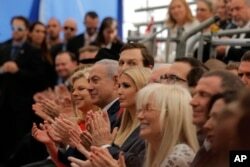 FILE - Israeli Prime Minister Benjamin Netanyahu, front row center; his wife, Sara Netanyahu, to his right; senior White House adviser Jared Kushner and his wife and the U.S. president's daughter, Ivanka Trump, seated to the prime minister's left; and U.S. Treasury Secretary Steve Mnuchin, at top right, attend the opening ceremony of the new U.S. Embassy in Jerusalem, May 14, 2018. While Israelis overwhelmingly welcomed the embassy move, the ceremony had a distinctly un-Israeli feel about it. The audience was made up mostly of skullcap-wearing Jews and Republican-leaning evangelical Christians who hardly share the values or politics of Israel's secular majority, let alone the liberal-leaning Jewish diaspora. The speeches were peppered with biblical passages and references to God, and two American pastors with a history of derogatory remarks about other faiths delivered blessings. The Reverend John Hagee once spoke of Adolf Hitler as a hunter sent by God to kill Jews, while the Reverend Robert Jeffress has called Islam and Mormonism "a heresy from the pit of hell" and said Jews "can't be saved." Still, they were part of the evangelical embrace of Israel that they say stems from Christianity's Jewish roots, and many view Israel's establishment as the fulfillment of a biblical prophecy. In Israel, they have been welcomed by a growing group of religious-nationalist Jews who share their messianic fervor. FILE - U.S. President Donald Trump's daughter Ivanka Trump, right, and U.S. Treasury Secretary Steve Mnuchin attend the opening ceremony of the new U.S. Embassy in Jerusalem, May 14, 2018. "Jerusalem is where Messiah will come and establish a kingdom that will never end. We thank you, O Lord, for President Donald Trump's courage in acknowledging to the world a truth established 3,000 years ago — that Jerusalem is and always shall be the eternal capital of the Jewish people," Hagee said in his closing benediction. "Let every Islamic terrorist hear this message: Israel lives." In secular Tel Aviv, the scene could hardly have been more different. Tens of thousands flooded to Rabin Square for the raucous return of Israel's newest folk hero, the charismatic winner of the gay-friendly Eurovision Song Contest. In Israel's cultural and financial heartland, neither the Jerusalem embassy nor the Gaza carnage was even mentioned. Netta Barzilai, 25, has won over Israelis and Europeans with her techno-dance tune about female empowerment, her message of inclusiveness and a personal story of overcoming adversity. Barzilai's victory, propelled by a European popular vote, was celebrated as proof that Israel could overwhelm those seeking to boycott it over its conflict with the Palestinians. As with any international success, it was part of Israel's quest to project its "normal" image to the world, rather than a place of conflict. And Barzilai used her newfound platform to project unity. Israeli singer Netta Barzilai, center, who won the 2018 Eurovision song contest, performs at Rabin Square in Tel Aviv, Israel, May 14, 2018. "We are coming together like we haven't in years," she screamed to the adoring crowd. "We have a reason to be happy. Don't let anyone dampen your spirits." Amid all the commotion, it was easy to forget that less than a week ago Israel seemed to be on the brink of war with Iran. Israel had just unleashed its most massive bombardment in Syria in decades, targeting nearly all of Iran's military installations there after an Iranian rocket barrage was fired toward Israel's positions on the Golan Heights. That unprecedented confrontation between the two bitter enemies came only days after Israel successfully hosted the start of the Giro d'Italia cycling race. The first Grand Tour event ever held outside Europe was yet another milestone in Israel's quest for normalcy and acceptance. Monday's split-screen images captured much of what still plagues Israel: a conflict with no end in sight and two opposing domestic camps trying to ignore it. "For a single historic second, Israel could ignore the elephant in the room. But we can't really erase the bitter parts of reality," wrote Nadav Eyal in Yediot Ahronot. "We can dance in Rabin Square to celebrate the Eurovision win and to imagine that history and all of its complexities have been shunted aside forever, but they haven't — the Palestinians are still there."